Who wants their bathroom and house torn up for days during remodeling? Maybe weeks? The answer: of course no one! 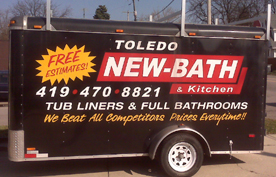 We have an experienced crew of professional installation experts who have over 50 years of installing bathrooms. Most remodeling and installations jobs can be completed in one day and you will have your bathroom back in full service. Sure "Chuck in a Truck" can do your bathroom remodel, but can he do it in one day? Give us ONE DAY and we’ll give you a beautiful new shower with luxurious new fixtures in your choice of colors and styles – installed by experts at a price you can afford. Satisfaction guaranteed. Call us Today! Enjoy your new shower tonight! 419-470-8821.